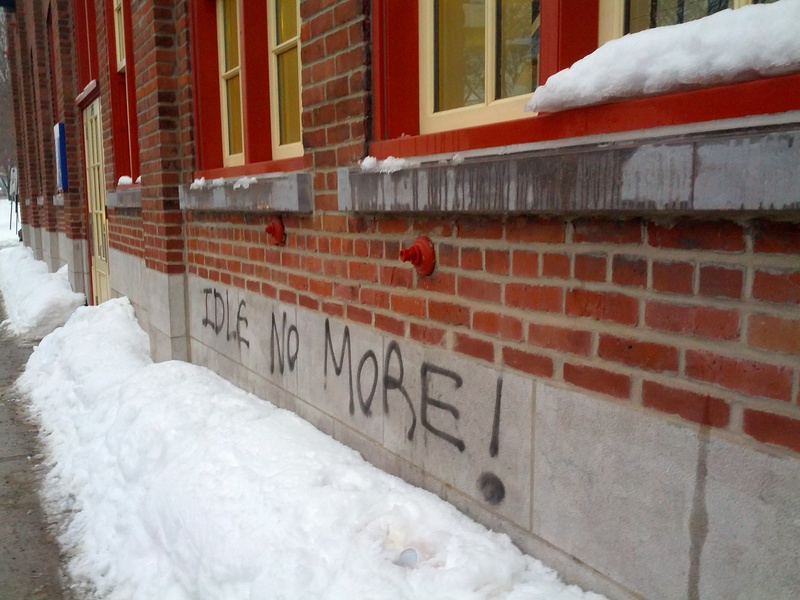 Idle No More has emerged to be the most important movement in Canada right now. For people who are new to Indigenous organizing or movements, it can sometimes feel like the issue is to too complex, too overwhelming and too large to understand. In partnership with the Canvass Campus Assembly Initiative, I’ve written this Q&A on Idle No More with an eye to a labour audience. This work should be seen as dynamic and suggested changes and additions are welcomed. Please share this with your colleagues, engage in the work and find out how you can support Idle No More organizing in your community. Idle No More has emerged as a civil rights movement where Indigenous people, regardless of region or nationhood, have united to tell Stephen Harper “Enough is Enough.” It was sparked by opposition to the Federal budget bill, C-45. After video footage of dozens of chiefs surfaced being denied access to the House of Commons, people took to social media and called for protests across Canada under the banner of Idle No More. Since then, hundreds of protests, blockades, traditional round-dances, drumming, and other events have taken place in towns and cities across Canada. Who is behind “Idle No More”? Idle No More does not have official “leadership.” Instead, it was founded by four women from Saskatoon and has spread into a national movement. Canada is a large country and there exist hundreds of First Nations communities. Combined with Indigenous activists and allies within towns and cities, the movement has grown to be too large for a single leader. Spokespeople have emerged who articulate the demands that are being expressed by the grassroots. But what about the chiefs? Aren’t they the leaders? In some communities, the leadership has been quick to join the chorus of voices demanding change. Chief Theresa Spence, for example, helped to raise awareness of the conditions of many First Nations communities through her high-profile hunger strike. But in other communities, the leadership is slower to join the campaign. In some ways, this is just like in the labour movement where it can sometimes be hard to gain the consensus among different unions, sectors and even within a local workplace. Imagine adding the presidents of the Canadian Labour Congress and the provincial labour federations into the mix; arriving at a consensus can be extremely difficult. And, just like in the labour movement, the side with power always tries to divide people to weaken the bargaining position of a movement. With Idle No More, there exists a broad consensus that something has to be done, but there are still large debates over how to fix what. It makes arriving at a consensus difficult, though certainly not impossible. What’s contained within Bill C-45? C-45, the federal omnibus budget bill, changes 44 federal laws. One of those laws, the Navigable Waters Act, has been changed to remove 99% of Canada’s lakes and rivers from previously existing environmental protections. Indigenous communities weren’t consulted on this change and expressed outrage as many bodies of water run through traditional territories. These changes will enable corporations to boost their profits by not having to abide by environmental protections. Why should workers support Idle No More? Many Indigenous people are union members. Supporting our brothers and sisters in the workplace is as important as supporting the struggles in which their communities are engaged. The labour movement has proudly played supportive roles in civil rights movements and Idle No More should be no exception. Fighting racism within the workplace and in our communities must be at the core of our collective work. Because of the relationship that Indigenous people have with “the Crown” (a.k.a. the federal government), all Canadian citizens have the responsibility to ensure that this relationship is functioning. When Stephen Harper breaks his promises or breaches his responsibility towards Indigenous people, Canadians must unite and demand that he honour the Treaties, or the agreements that formed the basis on which Canada was established. The Treaties? What are they? When Canada was being carved into provinces, many formal agreements were made between Indigenous communities and the Crown. Those agreements allowed for Canada to exist the way it does today. The Treaties outline what lands can be used for what purpose, the processes that exist to negotiate changes to these agreements and other policies. Many of these policies influenced the Indian Act, Canada’s only piece of race-based legislation. Part of the problems identified by activists in the Idle No More movement is that “Indians” as defined by the Indian Act are treated very differently from Canadians. They are subject to different rules for buying land or owning property, for example. The Act defines their nationality and excludes some Indigenous people because their parents and grandparents married non-Indigenous people. The Indian Act prevented First Nations people from voting until the 1960s, and also established the Residential School System. There have been numerous abuses allowed by the Act, which was originally intended to eliminate Indian identity entirely. The federal government has used it and other policies to try to subjugate Indigenous people; this has led to familial breakdown, poverty, unemployment and other problems. Idle No More is the result of activism that has been building across Canada for decades and is helping to awaken a new generation of activists to the possibilities of resisting these negative realities and to continue building a united movement. This seems overwhelming. Are there even any solutions? Idle No More activists have been offering ideas and solutions throughout the campaign, but the issues are complex. The most pronounced one is that the relationship between the federal government and First Nations communities has to be rebuilt. Stephen Harper cannot simply ignore the Treaties and pass laws that will impact First Nations people. For Canadians, Idle No More creates a space where everyone can demand that democracy start to work again. Canadians have benefitted greatly from the Treaties: industries, homes and communities would not exist had they not been signed. Through Idle No More, it’s time for Canadians to uphold their side of the bargain, support Indigenous brothers and sisters, and force our government to do the right thing. Why can’t they just become like the rest of us Canadians? Assimilation is a difficult subject. Because so many of us have been assimilated into Canada, the idea of protecting our own cultures or traditions can be hard to grasp. But while many immigrants made the choice to move to Canada (where their descendents still live), Indigenous communities had their ways of life forcibly taken from them. Many of Canada’s policies towards Indigenous people doesn’t resemble assimilation; they actually resemble genocide. After centuries of these policies, Indigenous people are standing up to say that they reject the attempts to take away their languages, cultures and identities. They are fighting for the protection of their people and future generations. Assimilation is not an option because it would erase the rich histories, cultures, languages and traditions that have existed here for time immemorial. Most of the policy decisions being made by the Harper government try to move, remove, or justify the transfer of people from their traditional territories. When Indigenous peoples were first forced onto reserves, it was often in remote, difficult places to farm, or far from urban centres. Many of these lands happen to be on top of diamond, gold, uranium or other precious metals and are now highly profitable and coveted by corporations. Many of these lands are in the way of oil and gas companies’ access to oil and gas. Many of these First Nations communities are living with the environmental disasters that have been left behind by profit-hungry companies. The most recent attack on First Nations communities is the same attack that workers face when company management wants to cut health and safety regulations, or cut wages to boost profits. The only difference is that First Nations communities have to contend with health problems from environmental disasters caused by corporations all the time. Standing in solidarity with Indigenous communities is important because these struggles are connected. A victory in a single plant or a single community is not enough. We need to stand up against corporate powers and their control over government decisions and bring democratic power back into communities. Nearly a month has passed since several Chiefs were physically denied access to the House of Commons to voice their concerns about changes that were about to be forced upon First Nations communities in the federal budget bill. This, combined with the work done through teach-ins in cities in Saskatchewan throughout the Fall culminated in the first day of action called for Dec. 10 in the name of Idle No More. With journalists slow on covering the Idle No More movement, the privacy offered by this group (sometimes mistaken for vultures) helped ensure that the grassroots could quietly develop the confidence needed to organize creative actions. No questions about leaders. No divisions magnified. No media tricks. Amid stories about shopping and Christmas, the mainstream press awoke to find a groundswell of support and action in communities across Canada. It was national. It was leaderless. It was grassroots. It was everything that the mainstream media is not equipped to write about. Then it started: The errors. The questions about leaders, chiefs and the cracks in the movement. The racist comments. The current state of shorthand journalism dictates that every story should have two sides: one side is the little guy and the other is the powerful guy, as if the biblical tale of David and Goliath is an allegory for every single political conflict that may arise. While there are parallels between this narrative and Indigenous struggle against colonialism, it isn’t the story of two people. It’s the story of hundreds of nations, millions of people dead, millions of survivors, hundreds of languages, one Crown with hundreds of agents, thirteen provinces and infinite excuses. This is too complex for a soundbite. This is too complex for a 30-second TV spot. It is under these conditions that divisions start to surface, exploited both by accident by these constraints and on purpose by columnists who intend to dismiss or dehumanize Indigenous people and their movements. On one hand, this story of genocide, colonization and neo-colonization is simple: settlers were brought by colonizing empires to settle “Canada” and push away the Indigenous populations. The result was centuries of government-sponsored murder or forced assimilation. As communities evolved to better resist this legacy, the Federal government looked at ways to take even more of their lands because of the mining, oil, gas or forestry opportunities that exist above or below. The result is a lopsided arrangement where few benefit and many suffer. But this story is laden with complexities: complex identities and players, roles, legal statuses, histories, denial, exploitation, exploited divisions, bribery, theft, bureaucracy, legislated identities, apartheid. Idle No More is compelling partly because it is so complex. It implicates everyone living in Canada. If we have ancestors who lived here, it implicates them too. Idle No More risks being written off by the mainstream press much in the way that Occupy Wall Street was; sure, the campaign has noble goals but its leaderless, multi-issue approach will ensure that it fizzles out. Activists need to learn from the strengths and weaknesses of other social movements and already, its clear that mistakes made by Occupy are not being reproduced. Spokespeople have emerged who are talented speakers and who are generous enough with their time to do the all-consuming TV circuit. Like during the Québec student strike, events are springing up across Canada daily, keeping the momentum of the movement alive. Idle No More is strong because it is a grassroots movement. As long as people continue to demonstrate it will remain a grassroots movement. And, the longer these events go on, the more vicious the attacks against Indigenous people and the movement will become. Unfortunately, federal politicians know this terrain; they have had centuries of learning how to most effectively divide Indigenous communities and people and foster in-fighting. Just look at Jason Kenney’s Twitter feed to see how this plays out. And when the mainstream press views the roles of chiefs as being to control their people, as stated in a Globe and Mail headline, the analysis of the complex issues is nearly always to be just as offensive and fall just as flat. 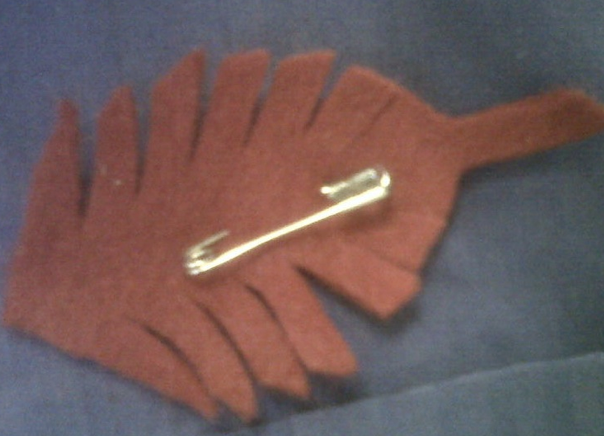 Both forces will be working in different ways to ensure Idle No More goes away. The resilience of the movement will lie in the resilience of people to continue to rally, to flashmob, to write letters, to interrupt economic activity and to ensure that “life as usual” ceases to exist for the folks in Ottawa. We need to expose attempts to divide or co-opt the movement in a way that is accessible and easy for people to understand. Through our collective creativity, our thirst for justice and our desire to fight the powers who are imposing their agendas on us all, the attempts to break Idle No More that will inevitably come cannot be successful.